The church of San Isidro prominently marks the "center of town" in Malojloj. Malojloj started as a farming community, back in the 1950s, Therese says. And then families migrated up from Inarajan, or got married and decided they wanted to raise their families away from the water. Because of Inarajans proximity to the ocean around the village area, whenever we have typhoons, the village gets devastated." The houses were made with the tin roofing, which just doesnt last, Bill adds, plus the termites, so they would just have to build and rebuild. The other reason is that the area is very small in Inarajan, so here you are and you know what actually caused that with Malojloj. "Most of the people from Malojloj were really from the village and other areas like Belen where Im living. Most of these people had to relocate because of the typhoons. Typhoon Karen was the one responsible for that move." 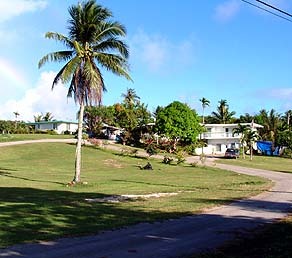 House lots in Malojloj are much larger than in Inarajan village, allowing for expansion of the homestead. This is all one family complex. 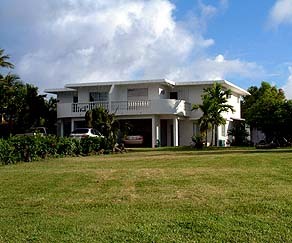 One of the nice new homes in Malojloj. The historic locations of the Chamorro houses were predominantly in the more sheltered areas, the lowland areas that were less windy and less risky, John Brown remarks. But then Typhoons Karen and Pamela came in and tore even those up. Karen took out something like 90% of the houses on the island. Pamela finished off the majority of the ones that got rebuilt. In Karen, some of the houses got rebuilt in wood and some got rebuilt in concrete and that was 1962. And so the ones that were rebuilt in 1962 got destroyed in 1976. "And the island got more prosperous during that period too, so people could better afford to build concrete houses. So by 1980 or so, the dominant housing had become concrete and they started building more and more on exposed locations because the concrete houses were much more durable and able to withstand that." A scarecrow guards a rare, small patch of farmland in Malojloj. 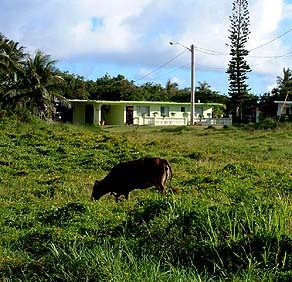 Most of the farming now takes place further uphill, while Malojloj proper has become a predominantly residential area. When Malojloj was subdivided," Bill recalls, "it was really supposed to be a farming area. When I was growing up it was meant to be not a residential area but people going to land for the landless where they needed to farm. But it didnt turn out that way. I believe that whats happening now is rezoning so that Malojloj becomes more of a residential area than a farming area. The typhoon and then the subdivision have caused that." Malojloj is under Inarajans jurisdiction, Inarajans municipality, Joe explains. 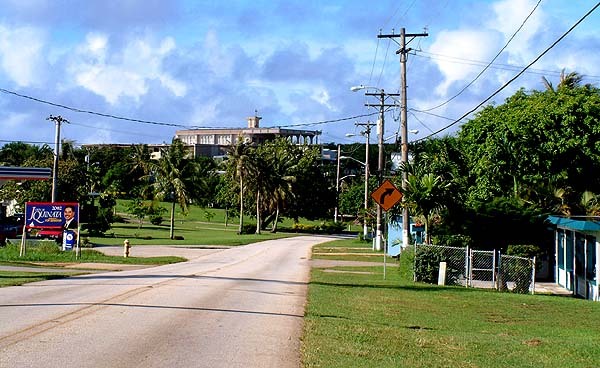 But Malojloj has evolved from farmland or ranch community into its own developed, rural community. The people of Malojloj are extended families of the community in Inarajan. 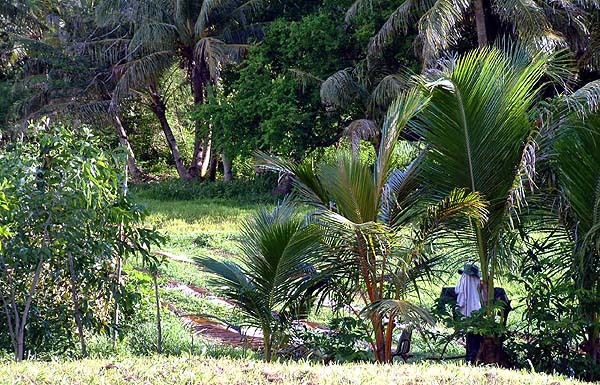 Over the years, families have grown and land is really scarce down in Inarajan, and so land up in the farmlands or the ranch in Malojloj have been used, been parceled, for families to live in. And not necessarily to farm in anymore. Malojloj is part of Inarajan, and up there a church has been erected, its a new church. Its a church of San Isidro, the patron saint for farmers. And beside the church is the monastery of Carmelite nuns." 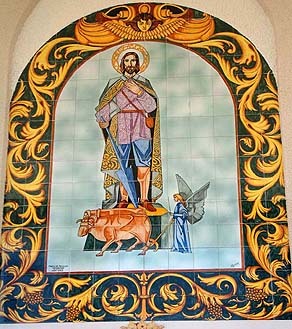 Image of San Isidro above the entrance to the church in Malojloj. "Malojloj has a different saint, San Isidro," Therese says. "I guess because Malojloj is a farming community, and San Isidro is a farmer, the patron saint of farmers. If you go to Malojloj and you talk to anybody who resides in Malojloj they will say yes, San Isidro is the patron saint of farmers. And the farmers pray to him to help them with their crops to make sure everything is all right with their weather, and that the crops will be fine. Because a lot of people there make their living farming. "San Isidro was a very hard-working person. I guess one day he was sick and there was no way for him to farm the land and there was no way for him to support his family. So an angel came down and farmed for him, and he was able to move the animal across and plow his fields and plant the seeds and thats how San Isidro came to be. "When he was well again, he worshipped God. He prayed to God, he was a very religious man, and so he knew that God had helped him in taking care of his family. That is why the people of Malojloj, the farmers, they look to San Isidro for good crops and good weather, and making sure their families are taken care of." The growth of Malojloj has been fairly recent. Jeff Barcinas states, "I think that village started growing in the early '80s. I mean it started to blossom actually in the '80s and '90s, so just within the last 20 years you can pretty much say that Malojloj has developed." "I think the community right now has accepted agriculture and farming as a key component of their lifestyle. Though it falls under Inarajan as a single municipality with one mayor, it seems like everybody is moving up there. So what you have in Inarajan is more like just an icon for purposes now of tourism. There are some people still living there, so you dont have a dead village. And theres Gef Pa'go down there, which is like a cultural village." Gef Pa'go is a recent development that should carry Inarajan onwards into the future.